Written and assisted directed by Michael Hanna, with choreography and direction be Regina Peluso and music direction and arrangements by Shannon Van Der Reck, this is an ambitious classic work of literature for Collide to take on. And yay for being ambitious! The original story (which is far more complex than we remembered) is about Dorian Gray, a young man about town who is the subject of a painting by artist Basil Hallward. Through sitting for the painting, Gray becomes acquainted with Lord Henry Wooton and becomes immersed in Wooton's world of decadence and hedonism. Gray makes a wish that he will stay as young and beautiful as he is and the painting will age instead of him. Debauchery, lost love, revenge and murder ensues as the painting shows the strain of Gray's hard living. Fearing the story was indecent, the magazine's editor deleted roughly five hundred words before publication without Wilde's knowledge. Despite that censorship, The Picture of Dorian Gray offended the moral sensibilities of British book reviewers, some of whom said that Oscar Wilde merited prosecution for violating the laws guarding public morality. In response, Wilde aggressively defended his novel and art in correspondence with the British press, although he personally made excisions of some of the most controversial material when revising and lengthening the story for book publication the following year. Michael Hanna transports the story to the late 1990s and sets it in the world of fashion with a all-female cast. Dorian Gray is a model, Basil Hallward is a photographer (rocking a denim jumpsuit), and Lord Wooten is designer Lady H (in full Sigourney Weaver gloriousness). 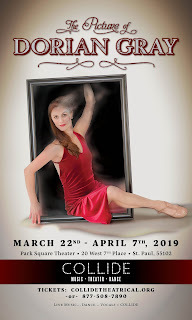 The cast is universally excellent, with standouts in Chelsea Rose as The Picture and Heather Brockman as Lady H. The music selections are perfectly paired with the story. Katie Gearty and Katie Bradley (who also stars as a love interest for Dorian) sing the hell out of songs from Madonna's "Vogue" and "Fame (What a Feeling)" to "I Put a Spell On You" and "Young at Heart." Gearty in particular is a treat--she can sing anything and everything beautifully. Although the dancing is excellent and the music is wonderful, the story doesn't totally come together for us. I don't think dance and music alone can convey the wish for youth and beauty, particularly when the roles are played by young and beautiful performers. Also, I think the lack of a major antagonist (a vengeance-seeking brother) leaves the story without the bite it could have had. Still, we love Collide and are eager to see what they bring us next! Not much, it's Park Square Theatre. But it was a treat to be able to choose our own seats at Dorian Gray. We sat in the second row! We never get to sit that close! $$$.